The Molten Salt Fast Reactor (MSFR) is the only Generation-IV reactor with a liquid salt to carry the fuel and to transport the heat. This special feature enables the MSFR to use innovative safety features, like the freeze plug and the mechanism to drain the fuel salt in fail-safe storage tanks underneath the reactor core. 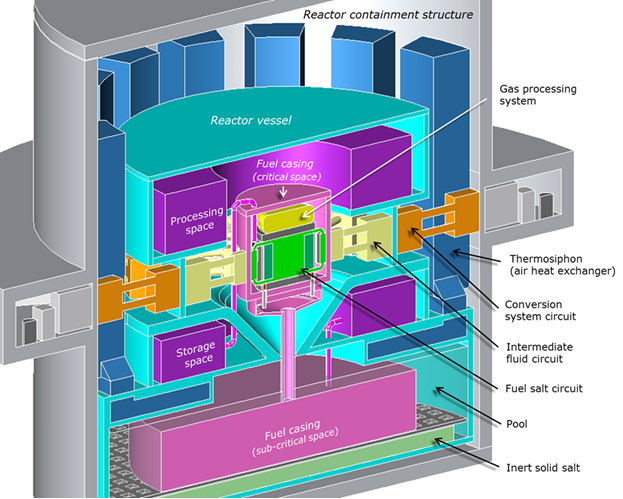 The Molten Salt Fast Reactor (MSFR) is a further development of the graphite-moderated molten salt breeder reactor originally designed at the Oak Ridge National Laboratory in the 1960’s, and is the current reference design studied within the Generation-IV International Forum. It consists of a cylindrical vessel with diameter and height of 2.25 m made of a nickel-based alloy filled with a liquid fuel salt under ambient pressure at operating temperature of 750 oC. The fuel salt, 18 m3 in total in the primary circuit, is pumped around in upward direction through the central core zone and in downward direction through the heat exchangers located circumferentially around the core. In between, a container is located filled with a blanket salt containing thorium to increase the breeding gain. A schematic view of the primary circuit is shown in the figure below. Schematic layout of the MSFR core. The central region (green) is the core surrounded by the annular breeding blanket (red). The heat exchangers are located circumferentially around the vessel. The reactor is designed with a fast neutron spectrum, and can be operated in the full range from breeder to burner reactor. 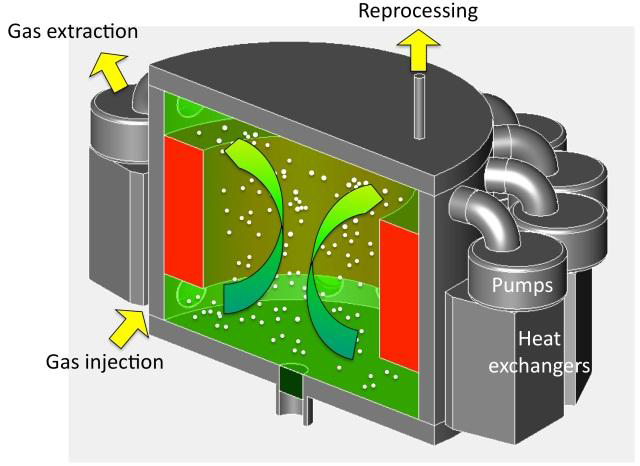 This flexibility is facilitated by the fact that the fuel salt composition can easily be adapted during reactor operation without manufacturing of solid fuel elements. During reactor operation a fraction of the salt is continuously diverted to an ex-core salt clean up unit to extract lanthanides and actinides. A more detailed view of the MSFR plant layout is shown in figure below. The fast neutron spectrum relaxes the requirements for this process enormously. While in a thermal molten salt breeder reactor, the salt should be cleaned at a processing rate of about 4 m3/day, this is only 40 litres/day in a fast reactor. The salt clean-up process is a unique feature of the MSFR and contains two major steps. First, the gaseous and non-soluble fission products like the noble metals are removed from the primary circuit by gas bubbling near the pumps. In a second step the uranium, actinides and some fission products that are strongly bound to the salt, can be separated by pyro-chemical techniques (fluorination and reductive extraction) in the ex-core chemical plant. Thermal expansion of the fuel salt. Natural circulation of the fuel salt. Draining of the fuel salt. High solubility of fission products in the salt. All these mechanisms lead to a robust safety approach of the MSFR, which we will validate and quantify in SAMOFAR by advanced experimental and numerical simulation tools.